The one thing I would be really proud to hear when I meet anyone at Volindia would be when Tushita says, "Oh! And she is our youngest volunteer".. EEEEE... I feel all so excited. Whenever I move out of my home, there is one thing which disturbs me the most, Poverty. I feel sad and would really want to ask God, "Why did you do this?". Although now you would wonder that why don't I help them, in any way? I would simply say, the day I start earning, I will surely do my bit to help these people, because even they have the right to have a decent standard of living. So, it's a promise. I am often asked on what really drives me to volunteer. For most people it is the desire to do something good, to give something back to the society. While I agree with all of these ideas in principle, my propensity to volunteer comes from a baser motive. Hands on germination of ideas have always fascinated me. I am literally jumping out of my chair whenever I think about an Idea that I helped implement, or even my vision for a particular entity of which I was the founding member. 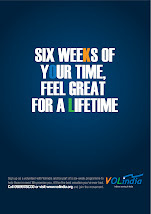 And if I may be so brash and narcissistic, I do consider myself to be the founding member of VolIndia. Two years ago, when I spent some time with the Make A Wish foundation, it was just starting in Delhi. I was fortunate enough to have been part of the core fundraising team. It was a lot of fun, but it also required us to be quick and efficient while dealing with people who did not have a lot of time, namely, the corporate. And I am not ashamed to say this, but we failed miserably in the latter bit. But the experiences we had along the way made the entire endeavor quite an enriching one. VolIndia generates much more passion in me than MAW ever could. While it just started out as “something to pass my time”, in the post college – pre job phase of my life, I increasingly find myself thinking more and more about how the organization can grow and prosper. We haven’t had ONE great idea all of a sudden (what some people call the EUREKA!! Moment of their lives), but rather the growth has been more incremental. In that sense, I think the team complements itself very well. We will discuss one idea here, one idea there, and over a period of a few such discussions; a coherent picture of how to proceed will emerge. Not to say that this is all we do!! Work is just what to do between fun!! What else do you get when you put a couple of completely crazy young people in a room together. What I will remember most about VolIndia is the meetings at Café Coffee Day, or the countless moments spent giggling with Sunanda over the poorest of jokes with Rajika staring at us with an expression of utter surprise. The few lunches I have had at office have also been a lot of fun I would remember the one with Viren, because that was the day of Interviews. . Taking interviews was quite enriching in terms of the wide spectrum of people that we met , and it was fascinating to know about the varied varieties in which people have tried to make a change in and around them regarding issues they feel strongly about. That is all I have to say for now, but this certainly is not the last you hear from me , dear Reader. Thank you for being so patient, and I hope you enjoyed your journey with me through what it is like Volunteering with VolIndia. Now get off that comfortable chair, and go Volunteer!